(Logan, UT — October 1, 2018) Join Altra in celebrating the 50th anniversary of the National Trails System Act, signed on October 2, 1968, to fund the creation and protection of America’s favorite long trails. Altra’s updated Lone Peak 4 Mid is the ideal trail shoe for tackling icons such as the Appalachian Trail, Pacific Crest Trail, Arizona Trail, Ice Age Trail and many more. Deemed a “runnable hiker”, the Lone Peak 4 Mid has all the benefits of the Lone Peak low version, but with an extended upper for better protection and support. When the Trails Act was signed 50 years ago, heavy-duty brown leather boots were the standard. Today, hiking footwear has evolved, and hikers stress the importance of lightweight, comfortable footwear for long distances. Altra’s unique design is ideal for trails by reducing overall exertion to help maintain good form. The Zero Drop™ platform promotes good posture by returning feet to their natural shape, while the FootShape™ toe box allows your toes to splay out for maximum stability and grip on uneven terrain. Of those who completed the Pacific Crest Trail, which covers 2,659 miles from California to Washington, 51% wore the Altra Lone Peak, according to thru-hiker website halfwayanywhere.com. On the iconic the Appalachian Trail, which spans 2,200 miles from Georgia to Maine, a survey by thetrek.co found the Altra Lone Peak was the top trail runner of 2017 with 16% of all A.T. hikers wearing this shoe. To make the Lone Peak 4 Mid even more of a long trail tackler, this shoe was completely redone starting with more aggressive, multi-directional lugs on the TrailClaw™ outsole for stronger toe-off and increased traction. The outsole also features upgraded DuraTread™ for the perfect combination of grip and durability. The midsole has a redesigned built-in skeletal StoneGuard™ for better protection and flexibility. The upper has proven ballistic mesh for exceptional durability, enhanced drainage zones for quicker water release, Altra’s 4-Point GaiterTrap™ for the snuggest fitting gaiters and a more secure feel with Altra’s A-Strap and integrated tongue. 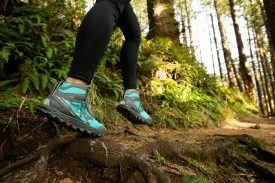 The Lone Peak 4 Mid has a 25 mm stack height and weighs 12.3 ounces for men and 10.3 ounces for women. Color options are black and red/gray for men, and black and teal/gray for women. The Lone Peak 4 Mid retails for $130 and is available now at www.AltraRunning.com or at your local specialty running retailer.